Princess Sofia attended today the opening of the exhibit Porphyry - A Royal Stone at Sven Harrys Art Museum. If you are like me and do not know what Porphyry is, read the rest of this paragraph! Porphyry is a hard stone, anciently quarried in Egypt, which as a dark purple-red color. Inside the stone is small crystals. The reason that Princess Sofia was chosen to open this exhibit is because it has a special connection for her and her history. 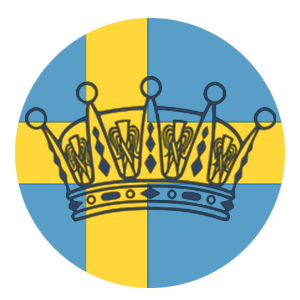 Many are aware that Sofia is from Älvdalen- a municipality in Sweden. Älvdalen is also the location of Sweden's Supply of Porphyry. The Porphyry in Älvdalen also has a strong royal connection- in 1785 samples were shown to Gustaf III who wanted to use it to decorate Haga Palace (where Victoria and Daniel live). In 1788, Elfdahls Porfyrwerk (The Porphyry Works of Älvdalen) opened and was privately operated until 1818 when Karl XIV Johan purchased the works and renamed it after his son Oscar I. The Porphyry works were sold back to a private citizen in 1857 and then in 1867 a fire took place at the works and 2 of the 3 grinding mills were destroyed. It ran on one mill making only small objects until the 1897 when it was sold again. This owner founded Älvdalens Nya Porfywerk (The New Porphyry Works at Älvdalen) and in 1988 King Carl XVI Gustaf opened up the Porphyry museum. You can read more about the exacts of this exhibit, here. Princess Sofia wore a new/old dress (sold in 2014) from Zara and wore her black Stinaa.J pumps. She also wore her Pilgrim Silver Plated Teardrop Earrings. She carried an old (unidentified) clutch.